In the world of Ayurveda, Marma is known as the vital points of the physical body where the concentration of energy and life is said to dwell. And, it is in the spirit of Marma that a wise healer of Ayurveda shared her recipe for Abhyana, which is literally translated from Ayurveda to mean "the application of oil." Her recipe also included a full body scrub that was applied with the intention of relieving bodily tension and forcing toxins to take leave from the skin. Here, we are privileged to present our own sacred Coconut Scrub that rightly pays homage to our Shaman's Anhyana Scrub. In the recipe here presented, crushed Coconuts and Dead Sea Salts are whipped into a gorgeous frenzy and then seasoned with a respectable helping of essential oils, extracts and butters that give kind care to deprived skin. The divine result of our work is a Coconut Scrub that lends itself beautifully to any greenie’s sacrosanct home spa ritual. SpaFetish Coconut Scrub – Our 16 oz. 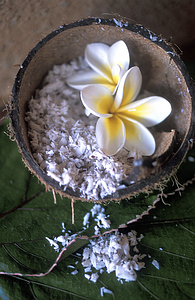 Coconut Body Scrub contains Coconut, Dead Sea Salt, Shea & Vitamins. Free 8 oz. SpaFetish Coconut Shower Wash included. Here, our Coconut Scrub is served unadorned for the greenie who loves the natural scent of Coconut. We only add the welcome presence of sweet Coconut Cream to elevate the drama. This Coconut Body Scrub is presented in a recyclable 16 oz. jar. A gratis 9 oz. bottle of Coconut Shower Wash is included. SpaFetish Pineapple Coconut Scrub - Our 16 oz. Coconut Pineapple Scrub contains Coconut, Pineapple & Vitamins. Free 8 oz. Pineapple Shower Wash included. Here, our Coconut Pineapple Scrub pairs beautifully with the sprightly sweetness of pure Pineapple Juice and Pineapple extract for our own updated version of the ever ubiquitous Pina Colada. This eco-chic Coconut Scrub is presented in a recyclable 16 oz. jar. A gratis 9 oz. bottle of Coconut Pineapple Shower Wash is included. SpaFetish Rose Coconut Scrub – Our 16 oz. Coconut Rose Scrub contains Coconut, Rose, Shea & Vitamins. Free 8 oz. Rose Shower Wash included. Our Rose Coconut Scrub weds pure Coconut with Rose Otto and African Geranium for a feminine fabulous body scrub that steps up to a higher level of exquisite. 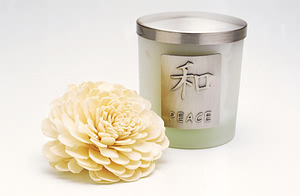 Our Coconut Rose Scrub is presented in a 16 oz. recyclable jar. A gratis 9 oz. bottle of Coconut Rose Shower Wash is included.